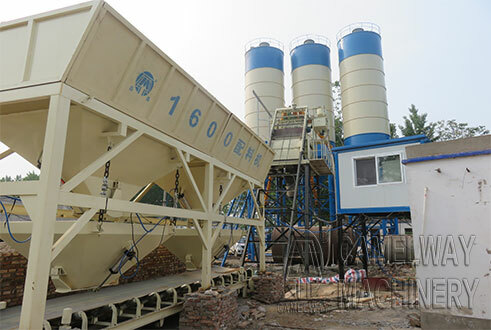 The main difference between semi-automatic and automatic HZS50 concrete mixing plant lies in the control system, other devices are basically same. The fully automatic control system adopts the automatic control system, while semi automatic control system adopts the centralized control system. What is the difference of the different control system in HZS50 concrete mixing plant. The nominal production efficiency is same, the only difference is the different ways of working. As long as click the operation, the material in the fully automatic control system will automatically unload from the cement silo to the screw conveyor, then transport it from the screw conveyor to the weighing hopper, then automatically unload it into the concrete mixer, the entire production process just need to click the operation, which is very simple and convenient to use, and very suitable for the staff of the mixing plant. While centralized control system can not be so simple, it is done step by step. For example, when charge the material, click the button, then materials will be automatically transported to the weighing bucket, when discharge the material, click the discharging button, the material will automatically discharge into the concrete mixer. The centralized control system needs more people to participate. For more information about any of our products, please feel free to contact us or at the contact addresses available on this website.